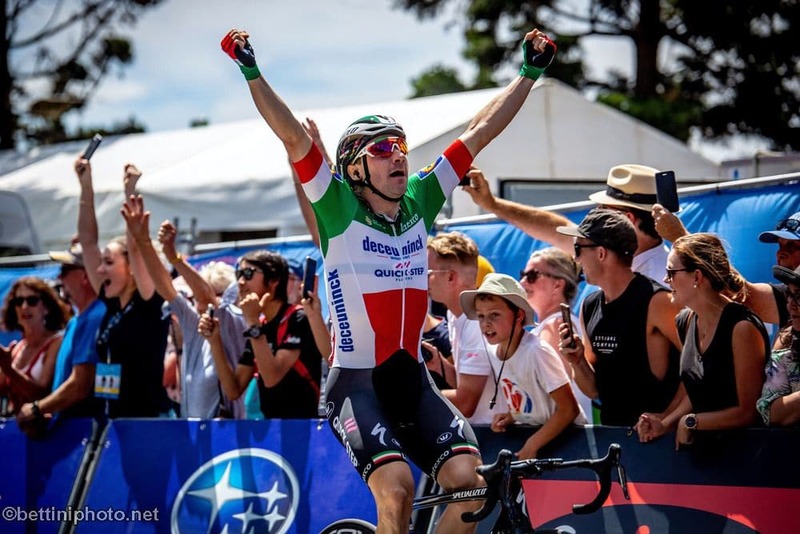 Italian sprint king Elia Viviani held off Australian rival Caleb Ewan and South African Daryl Impey in a tight finish to win the Cadel Evans Great Ocean Road race on Sunday. Viviani was able to stay with the lead group over four tough climbs and emerge from the slipstream of Deceuninck-Quick Step teammate Michael Morkov in the final meters to pip Ewan at the post. Lotto Soudal rider Ewan was unlucky to find himself boxed in at the start of the final sprint and while he finished fast, he ran out of road to overhaul Viviani who finished in 3 hours 54 minutes and 35 seconds. The 163 kilometer (101 mile) race, which starts and finishes in Geelong, outside Melbourne, and takes in the world-renowned Great Ocean Road, has seen a different nationality win each year since its inception in 2015. Viviani came to Australia on a mission after being beaten into second last year by Jay McCarthy, who could only finish eighth this time, and he was over the moon. “It’s feels amazing. I was really focused on this race,” said Viviani. “I was really happy with the performance of the team.